We offer one, two, and three bedroom housing options. At Hanover Grove the cooperative pays for gas (which includes heating, hot water, stove and a gas dryer if installed by the member), water, and building and grounds maintenance. Members pay for electricity and telephone. To inquire about available units or any other questions, contact our office. note: Applications must be picked up from the cooperative office. note: Please click on the thumbnail image if you would like to see the full sized floor plan. 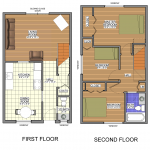 One bedroom units are 700 square feet and do not have a basement. 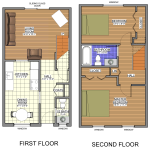 Two bedrooms are 933 square feet and have full basements with washer and dryer hookup. Three bedrooms have 1044 square feet and have full basements with washer and dryer hookup.